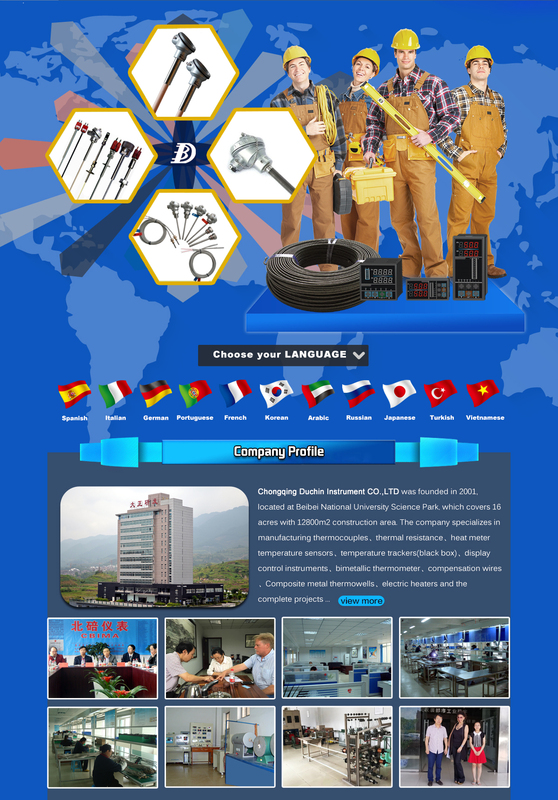 Chongqing Duchin Instrument Co., Ltd.
Chongqing Duchin Instrument CO.,LTD was founded in 2001. The company specializes in manufacturing thermocouples\thermal resistance\heat meter temperature sensors\temperature trackers(black box)\display control instruments\bimetallic thermometer\compensation wires\Composite metal thermowells\electric heaters and the complete projects of instruments and apparatus. Depending on the complete product development system, leading technology advantages and fine management system, the company has been developing steadily. The company is ISO9001 quality system certification enterprise, being the President Unit of "Chongqing Beibei District Instrument Industry Association", being the Viec-president Unit of "Chongqing automation and instrumentation association", and being the standing director unit of "National instrument functional materials association", which responsible or engaged in over ten standard revision works of national and industry.